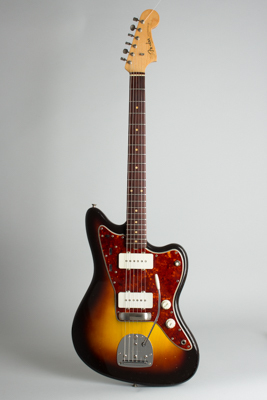 Fender Jazzmaster Model Solid Body Electric Guitar (1960), made in Fullerton, California, serial # 41163, sunburst lacquer finish, alder body, maple neck with rosewood fingerboard, original brown tolex hard shell case. This is an apparently not-much played and all original early slab-board Jazzmaster with a neck marking of 7-60, penciled soon after Fender resumed such dating that year. This guitar shows a bevy of the classic early 1960's Pre-CBS features including the unbound slab rosewood fingerboard with "clay" dot inlay, beautifully blended dark 3-color sunburst lacquer finish on the body, and gold "Spaghetti" logo headstock decal. The pickguard is the then-new nitrocellulose tortoiseshell style which had just replaced the anodized aluminum on this model about a year earlier. These early 60's Jazzmasters were the top of the Fender line at the time and are exceptionally fine instruments, with a still-unique sound. While they did not catch on with the jazz artists Leo intended them for, this was a radically new and quite popular guitar at the time, and was seen with many period players in a variety of musical genres. The Jazzmaster has been increasingly popular over the last couple of decades with new generations of performers re-discovering its particular charms. This one is newly set up and ready for its next 60 years of service, still in its original brown Tolex hardshell case. Overall length is 41 in. (104.1 cm. ), 14 in. (35.6 cm.) wide at lower bout, and 1 5/8 in. (4.1 cm.) in depth, measured at side of rim. Scale length is 25 1/2 in. (648 mm.). Width of nut is 1 5/8 in. (41 mm.). This is a very clean and original guitar, showing a number of typical small finish dings and chips but very little play wear overall. The neck finish and original frets appear to have simply not seen much play time. The headstock decal has a couple of small flaked-off spots. The guitar is complete, original and unaltered down to the snap-on bridge cover and nicely preserved brown Tolex case, which has wear mostly to the handle. A great playing and excellent sounding early Jazzmaster, one of the nicest from this period we have had. Overall Excellent Condition.